'Key and Peele' - For 'Black Nerds Everywhere,' Two Comedy Heroes Keegan-Michael Key and Jordan Peele, longtime friends and comedy-show colleagues, are about to launch a new show on Comedy Central. They say their shared experiences as the biracial kids of single moms have often been a comedy gold mine. Comics Keegan-Michael Key and Jordan Peele have known each other for years. They were both in the cast of MadTV. Now they're starting their own sketch-comedy series, due to launch on Comedy Central on Tuesday. You can learn a lot about what makes them tick in a sketch that features Peele impersonating President Obama, while Key plays "Luther," the president's "anger translator." Key paces back and forth, flails his arms and sometimes puts his face right into the camera like he's about to punch it. As President Obama, Jordan Peele is cool, calm and unflappable. Peele's mannerisms and tone are strikingly similar to the president's. Key and Peele say the idea came from a few different sources. But mostly, says Key, they wanted to "find a way to finagle Obama's nature and use that as a nugget. How could we ... get someone to interpret what we know he really wants to say?" The two friends and partners were even more inspired to write the "anger translator" sketch when, during one of Obama's speeches, a congressman shouted 'You lie.' Key and Peele say they were bothered by the fact that Obama barely reacted. "For him to have that much composure ... it's like, you don't have to — not after that. It was really a burr in Jordan's saddle," says Key. "He's like, 'C'mon, brother. If there was ever a time to get down to business, do it. How are you going to just put up a finger and keep talking regular?' "
"But that's what we love about him, too," says Peele. "He's so even-measured. He's so together. He's almost like Spock." Obama, Peele goes on to say, was the best thing to happen to black nerds everywhere. "Up until Obama, it was basically Urkel and the black guy from Revenge of the Nerds -- Lamar," says Peele. "Other than that, we had no role models. So he made us cool." 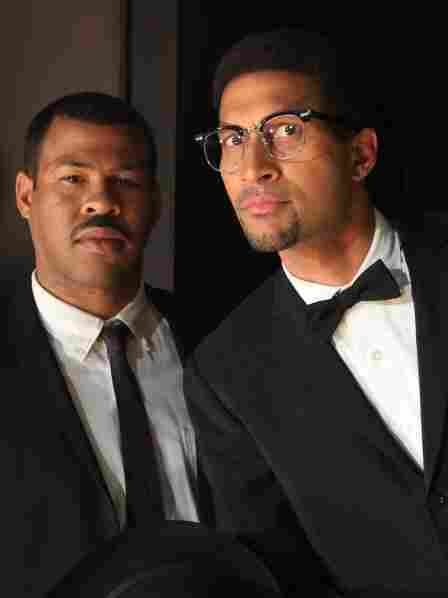 Peele and Key say Obama also made it easier to be biracial. Peele grew up in New York, the child of a single white mother. Key was raised in Detroit. His mother is also white. When they were younger, their biracial heritage was sometimes confusing, says Peele. "You go to school as a kid, and when your mom comes, and the kids go, 'That ain't your mama. Why you lyin'?' — as a kid, that is a deep insult," says Peele. "Our lifeline is our mom when we're little. So somehow that expectation, at a very young age, that we were supposed to live up to something because of what we looked like — I think that probably invaded our souls and gave us the need to do this kind of comedy on some level." Key says kids made fun of him for not sounding "black" enough — "every single day of grade school." Memories like that fuel another sketch, this one beginning with Key on a city sidewalk, talking on his cellphone. When a stranger, played by Peele, walks up, Key changes his voice to sound "more black." As they part, you realize that the second guy had been doing the same. Mekeisha Madden Toby, a TV critic for The Detroit News, says she loves "the posturing of it. I love that it taps into something no one's talking about." Because plenty of people are thinking about it, she says. "How do people perceive you versus who you really are, how you let people perceive you, all of those things — I think they just brilliantly tap into those things," she says. Madden Toby says Key and Peele have an opportunity to fill the void that was left on Comedy Central when comedian Dave Chappelle quit his show in 2005. Key and Peele are huge Chappelle fans. But for now, they're not sure their new show will reach as many African-Americans as Chappelle's did. It's a tough crowd, they say. "It really concerns us, to be terribly frank," says Key. "It concerns us that African-Americans enjoy this show." Key and Peele's debut show on Comedy Central includes parodies of a reality cooking show, being related to Thomas Jefferson, and the little lies husbands tell each other about their wives.